The mood in America is tense as the final votes are cast for the 2016 presidential election. Whether you are siding with Hillary or Trump, I can guarantee that you will always vote yes for cookies. Lily's Cookies, a bake shop in San Antonio, Texas, has made the most out of this fierce political season to speak to both sides of the political spectrum. 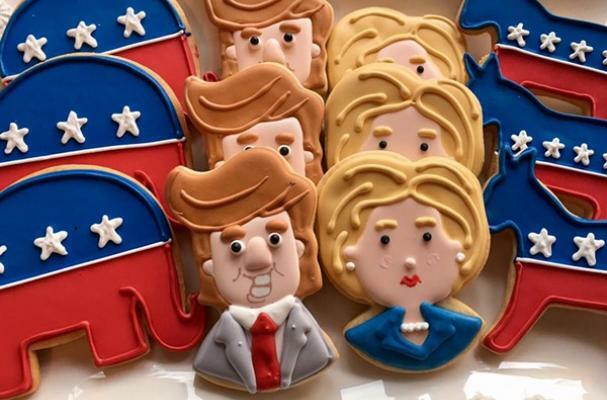 #imwithher fans will be inclined to pick up a dozen or two of the ornately decorated sugar cookie portraits. Similarly, Trump supporters will be representing the republican party with the elephant emblem. Instead of biting your nails as you anxiously await tonight's results, eat a cookie instead.